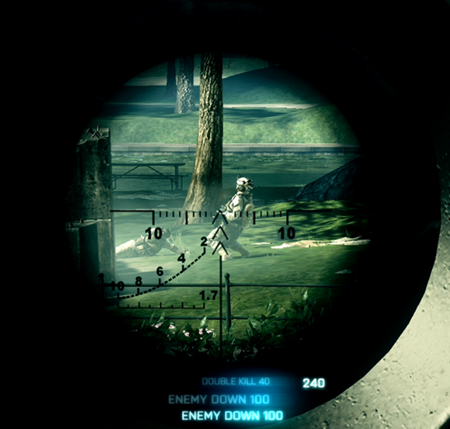 Sniping in BF3 is a controversial subject. We’ve all found ourselves on a team full of snipers ignoring the objectives. However, a good sniper can have their place on the team. For example, you can keep enemies away MCOM’s and flags, or prevent the MCOM your teammate armed from getting disabled if you’re a good shot. Here, I’m going to focus on eliminating enemies with a sniper rifle and staying alive. Get used to the amount of bullet drop each rifle has. To watch your bullet travel, continue holding the fire button after taking your shot. Practice aiming just above your target at medium range, and higher at longer ranges. Aim for the head. Headshots are a 1-shot kill with the bolt-action rifles and at most a 2-shot kill with the semi-auto sniper rifles. Keep moving. Don’t snipe from the prone position as it takes too long to get repositioned or to avoid explosives. Prone soldiers are also easy targets for other snipers. Spot your enemies as soon as you see them. Use the Q key on the PC, Back button on Xbox, or Select button on PS3 to spot. Spotted enemies will be easier for you to track, and if a teammate kills them instead, you’ll still get points for spotting. Hold your breath to steady your crosshairs. Use the Shift key on the PC or press the left trigger on Xbox/PS3 to stop your scope from swaying briefly. This will allow you to make a more accurate shot. Watch for scope glint from other snipers. This means they’re aiming at you. Either make the sniper your target or find cover. Continually look around the battlefield and use the spotting button every second or two. Spot in places where enemies commonly are found, even if you don’t see any. Spotting may allow you to find and track targets you might not otherwise have seen. Try out all of the different pistols and get familiar with your favorite. Your sidearm will be essential when you find yourself near to enemies. Use the straight-pull bolt instead of the bipod for bolt-action sniper rifles. This will allow you to stay scoped-in and keep a close eye on your target while firing multiple shots. If you’re in a firefight with another sniper, move unpredictably side to side and only stop to take a shot. This will make you very difficult to hit. Only take shots from extreme range if you have no other targets. Headshots are even more difficult at extreme range, and body shots will do less damage. Try to locate closer targets first. On smaller maps (city maps and many rush maps), try using the 4x or 3.4x scope. These scopes have no glint. This can keep you from getting your target’s attention. The lack of glint is particularly useful in dark surroundings as you can remain hidden from view. Skip the suppressor (silencer) and flash suppressor on sniper rifles in most situations. The suppressor increases bullet drop and the flash suppressor reduces damage. The stealth benefits typically do not outweigh these penalties. Practice with the M98 or L96, once unlocked. The M98 offers the fastest bullet speed (least drop) and highest damage. The L96 offers a faster bullet speed and firing rate than most of the sniper rifles, while maintaining good damage. Remember, sniper rifles are just part of the Recon role. You have a host of other gadgets at your disposal to help your team. Always make attacking and defending the objectives your primary goal.